„Afn beys-oylem‟ (On the Cemetery) is a version of Mikhl Gordon‘s Di shtifmuter (The Stepmother). 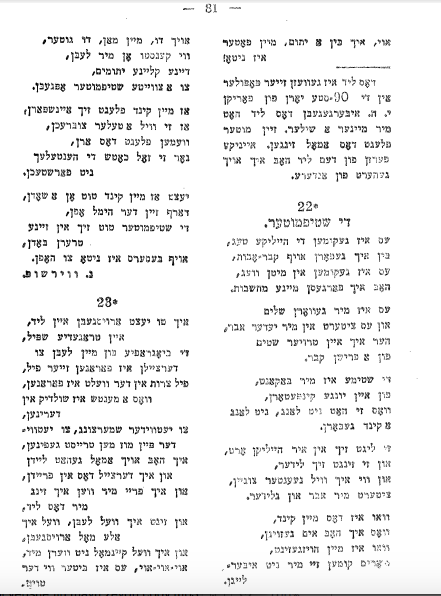 A complete text of the original in Yiddish can be found in the first volume of Antologye: finf hundert yor yidishe poezye edited by M. Bassin, 1917, pages 167 -169, and Perl fun der yidisher poezye edited by Joseph and Chana Mlotek, 1974, pages 29-31 (A translation of the Mlotek book into English by Barnett Zumoff – Pearls of Yiddish Poetry – was published a couple of months ago). 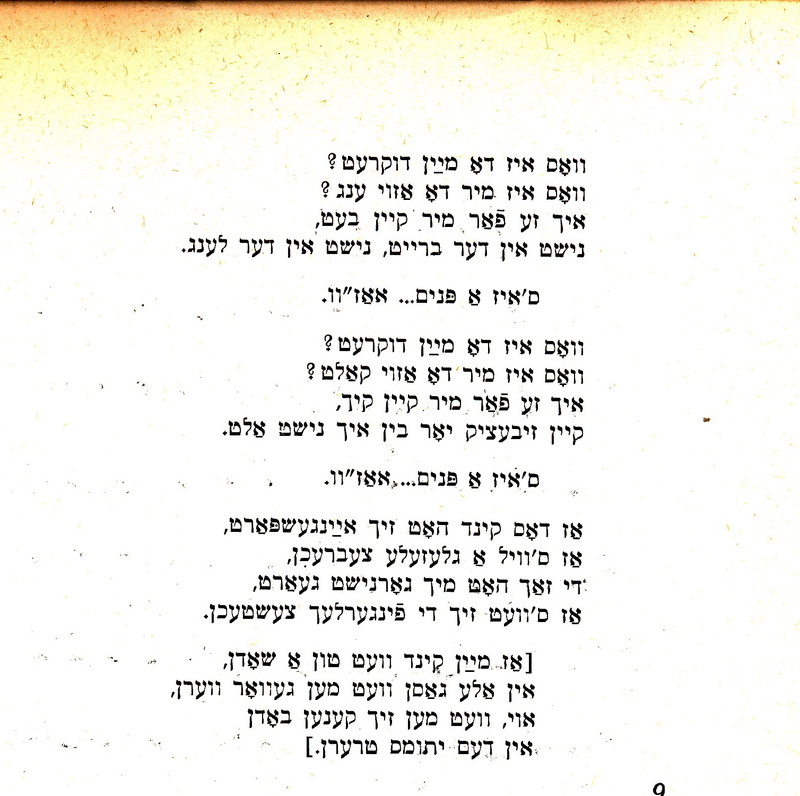 A similar version of this song is in Shmuel-Zanvil Pipe‘s collection „Yiddish Folksongs From Galicia‟ edited by Dov and Meir Noy and included in the Pipe-volume – Folklore Research Center Studies, volume 2, Jerusalem, 1971. In that text, a verse which names the husband “Avrum” is also sung; so a distinct Galician/Bukovina variant is clear, which is very different from the much longer original (there is no mention of the father‘s name in Gordon‘s text). But as sometimes, or perhaps often happens, the condensed folk-version has much more power and intensity. For other versions see note #9, p. 300, in the Pipe volume. 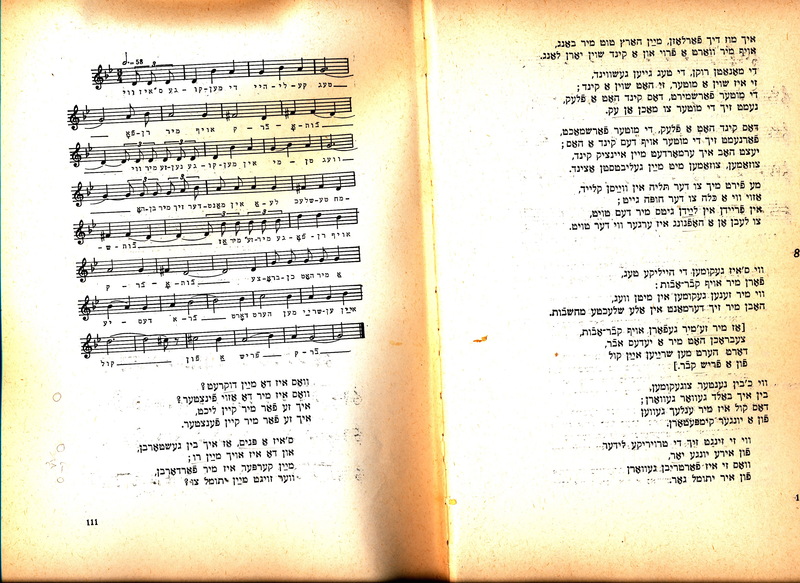 For more on singer Lifshe Schaechter-Widman (LSW) 1893-1974 click here. I consider this song the epitome of LSW‘s slow, mournful vocal style brimming with ornamentation. You can also hear the reach and power of her voice, which seems to float, if you will. She clearly flubs the second verse, singing only three out of four lines and does not rhyme the obvious „anider‟ and „glider‟. But she improvises a neat ending to the shortened verse and continues. Notice how she only repeats the last two lines in the final verse, the emotional highpoint of the song. This recording was done by Leybl Kahn in New York City, 1954. 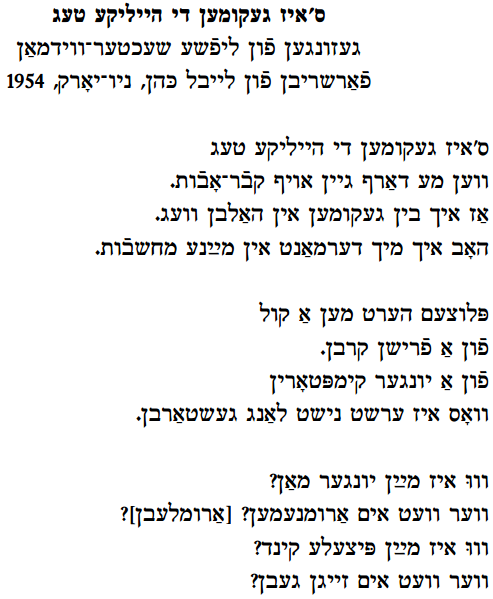 Please note that the Yiddish dialect of the singer is more accurately reflected in the transliteration than in the Yiddish text. dort hert men eyn kol fun ayn toyter nikeyve. Vos vil di shtifmame fin man eyn in eyntsik kind!? You can hear the voice of a dead woman. Oy vey! shouts the mother. Oy vey, woe to me. What does the stepmother want from my only child? zi varft im anider, zi heybt im of. zi tsenemt im a yede glider. she breaks every part of his body. Avrum, Avrum, di bist geveyzn mayn man. dem yusemeles futer, oykh min-hastam. Vi (azoy) kensti farnemen deym yusemls geveyn? Avrum, Avrum, you were my husband. and the father of the orphaned child, of course. Oy vey, is your heart made of iron, and you made out of stone? How can you stand the cries of the orphan? דאָרט הערט מען איין קול פֿון אײַן טויטער נקבֿה. אוי וויי! 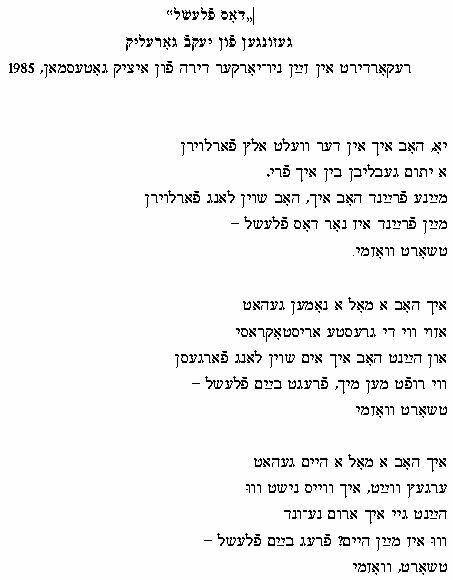 דאָרט שרײַט אַ מוטער — אוי וויי איז מיר און ווינד! וואָס וויל די שטיפֿמאַמע פֿון מײַן איין און אייציקן קינד?! 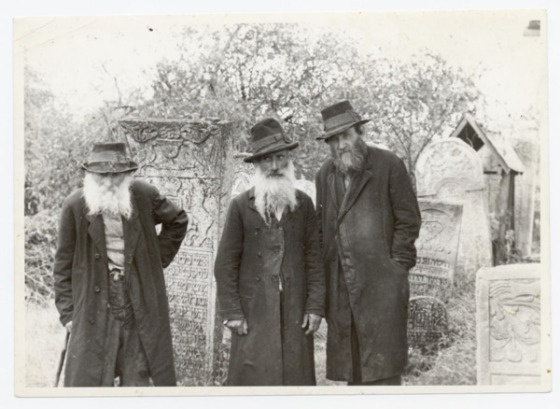 זי צענעמט אים אַ יעדער גלידער. 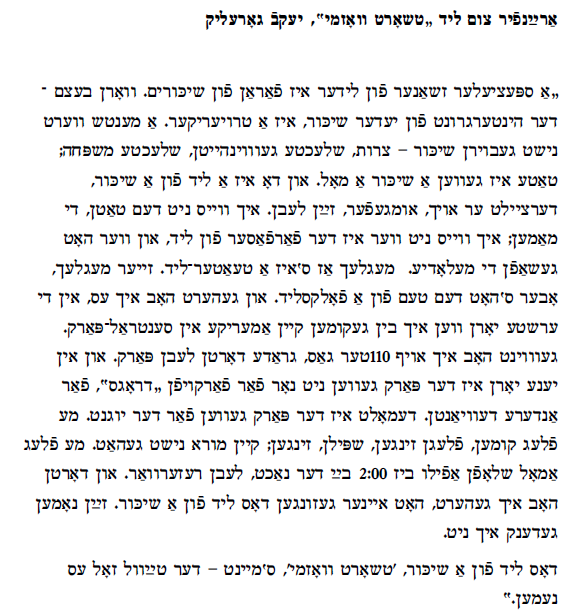 דעם יתומלס פֿאָטער, אויך מן־הסתּם. 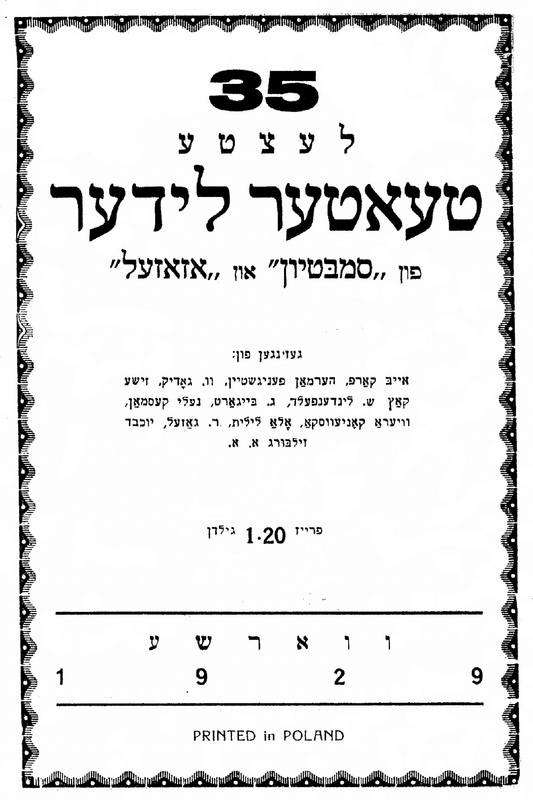 ווי( אַזוי) קענסטו פֿאַרנעמען דעם יתומלס געוויין?